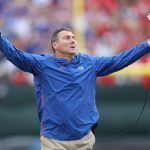 The annual Friday Night Lights junior football camp usually results in a fruitful recruiting weekend for the Florida Gators. 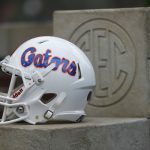 Results from this year’s event appear to be trickling in slowly, but Florida received its first bit of big news Saturday when 2020 quarterback prospect Anthony Richardson (Gainesville, FL) announced his commitment to the Gators. Richardson (6-foot-4, 213 pounds) is a local product out of Eastside High School, so Florida is plenty familiar with him. The fact that the Gators were willing to accept his pledge this early speaks to his potential as well as the fact that UF will likely go after two quarterbacks in the Class of 2020 cycle. In addition to committing to the coaches in person on Saturday, Richardson shared his big news via Twitter. He committed to Florida over Boston College, Louisville and Virginia Tech, among others. Richardson does not have a 247Sports Composite ranking yet, but the outlet lists him as a high three-star prospect and the ninth-ranked dual-threat quarterback in the nation. He is the third member of the Gators’ 2020 class, joining four-star athlete Keyvone Lee (Clearwater, FL) and three-star defensive end Josh Griffis (Bradenton, FL). UF’s class is ranked 11th in the nation at this time.